From "Rapper's Delight" to "Run It," DDR Universe has tracks to surely delight a vast audience. For some people, they've been waiting for a 360 DDR game to come out for a while. How well does this new mix measure up to the older Xbox and PS2 versions? A mixed bag of reactions sounds appropriate. In terms of music, there are only a handful of songs to survive the transition into the new game. "Ignition," "Put Your Faith In Me," and "B4U" are a few examples. Another mix of "Tsugaru" appears in this one as well. With the downloadable content, if you don't want to wait to unlock the songs, you can download them all in one swoop. There is a good array of very, very easy songs to very, very difficult ones. There is a beginner mode for those getting their groove on for the first time, and after that it spans through basic, difficult, expert and oni. Unless you have absolutely no life, never eat, drink or sleep, and devote all of your time and energy into DDR, don't even think about attempting oni. In the game manual it says, "Oni: Strictly for DDR pros." They are right, so listen to the nice people at Konami. Thankfully though, us humans who won't try that level for a while, we can have our fun learning the game with beginner, and eventually build up to tiring out at expert. Then, we might think about attacking the oni level . . . maybe. 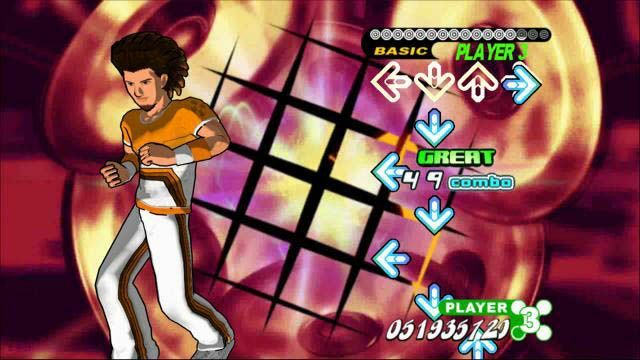 One rumor I heard about DDR Universe is that the animation in the background is sometimes distracting. I thought, "Oh, there were animations in past ones, how can this be distracting?" Well, I started playing, and realized that the rumors were true. I sometimes had difficulty focusing on the arrows because my eyes kept automatically wandering to the pretty moving pictures. What can be more distracting than the animations in the background? The dancers. Yes, the dancers. You can choose your dancer, and you can choose an outfit for them from the selection. After choosing mine, I immediately noticed that the dancer wasn't just moving around, looking like she can possibly be dancing to the music, even if she was a little off. No, she was dancing, and I couldn't believe it - they actually succeeded in making the characters dance like real people do! Having been a long time fan of the Dance Dance line of games, I was more than a little surprised at how much fun this 360 version is. Combining some pretty visuals with some off the chain tunes DDR Universe is still one thumping fun game. Unless you're in fare health though, have some caution because you will definitely get a work out. That is in fact one of the features in this game. A workout mode where you can track your calories!, there is a challenge mode that will test just about anyone's coordination. Surprisingly there is also a Quest Mode that I was not really sure how that would play out, but is kind of fun as you travel to different cities and recruit an ultimate dance team, in this mode you can also unlock songs and new videos. In past versions, there were tasks to do, which gave you the ability to unlock songs. This version is a bit quirky. You can do tasks and even get a songs dance steps perfect, if you do not have your fan base up, you fail the task. What's up with that? 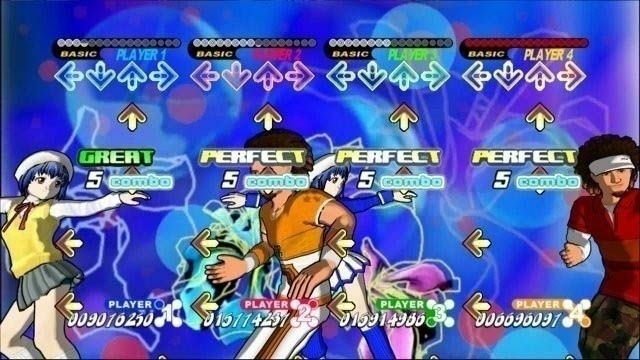 Perhaps the best thing about DDR Universe is it has an edit mode, if you happen to have mastered what the game has to offer you can now edit the back ground videos as well as the dance steps to any of the songs. Other online content for Xbox live includes downloadable new songs and dance steps and internet rankings. Now your friends you always met up with at the Mall can put their money where there mouth is by showing their skills on the leader boards. If I had to talk about the good with the bad, the music selection does not seem as varied, seems to be a lot more hip hop. Like I said the High Def graphics don't enhance it, in fact they tend to detract from it since they tend to be pretty distracting. With the screen seeming to get pretty busy and all the movement and flashing makes it hard to keep track of the arrows some times. 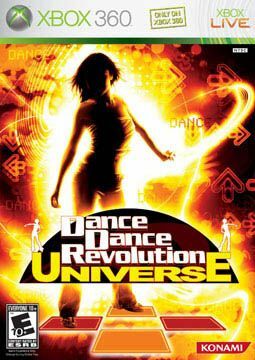 As fun as always with a few Xbox 360 twists, Dance Dance Revolution Universe is a keeper, even with the pretty distracting backgrounds, and slippery dance pad it comes with. Kick back, relax, Let's play!